I can remember summers as a kid when I must have been the perfect age to enjoy my vacation from school to the fullest. I must have been old enough to play independently, not too old to be too cool for kid stuff, and luckily I had a sister to spend my days with. For three months straight we’d play hard; hours of tag, bike rides around the neighborhood, campouts in the backyard, board games galore, and, of course, movies. Aladdin is one that comes to mind as a childhood favorite, as a VHS that was overworked & overwatched, but that never got old. I actually still own the tape I watched when I was 10-ish, and I recently sat down with my children to enjoy it again. Unsurprisingly, it was just as wonderful 20 years later. In the ancient deserts of the Middle East, a sultan reigns on high. His chief adviser, Jafar, is on a quest to find two scarab medallions, the Cave of Wonders that they will unlock, and a battered magic lamp that lies within the cave. But only one may enter to retrieve the lamp & release the powers of the genie inside; a diamond in the rough. That gem happens to be a special young man named Aladdin, a street rat who can’t afford to buy bread but a boy with a heart of gold. When he stumbles upon the princess Jasmine, who has run away from home, he falls instantly in love. And when Jafar accidentally helps him obtain the lamp, Aladdin wishes to be a prince so he can marry the daughter of the sultan and live happily ever after. But Jafar wants what is his, will stop at nothing to get it, and will reveal the fact that Aladdin is no more than a street urchin, despite the magic that the genie of the lamp supplies. What an amazing movie, from top to bottom, even after all these years. It came when Disney was on its A-game, pumping out hit after hit: The Little Mermaid & Beauty and the Beast, followed by Aladdin & The Lion King. That era has become known as Disney Renaissance, and it really was a great time to be a kid. This film has everything you want from a classic story perspective; the background, the hero, the princess, the villain, the magic, the heart. And the music, wow, let’s not forget how a soundtrack can make a film. Arabian Nights, One Jump Ahead, Friend Like Me, Prince Ali, A Whole New World; perfect music, songs we still sing today. But the genie steals the show, voiced by the legendary Robin Williams, and became a symbol of Disney in a way not many other characters have ever pulled off. 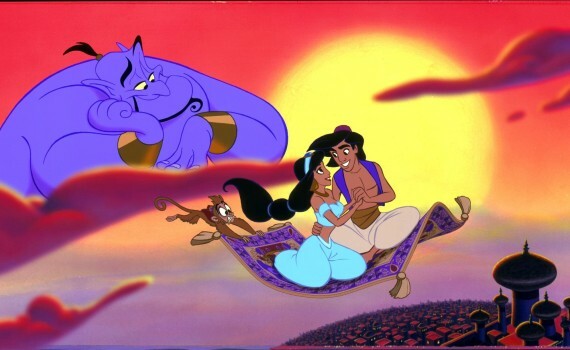 Aladdin is 90s animation gold, a standard that is still hard to meet, and a movie I will always love.